I worked at the Visitors Center today. Before leaving the campground, I met a Pacific Crest Trail (PCT) hiker taking a break from the PCT. He was concerned about a group member who had not caught up with his group. He said the man had had a hard time with the Half Dome hike (as would most mortals). He planned to contact a ranger for help. I had never heard that one before. 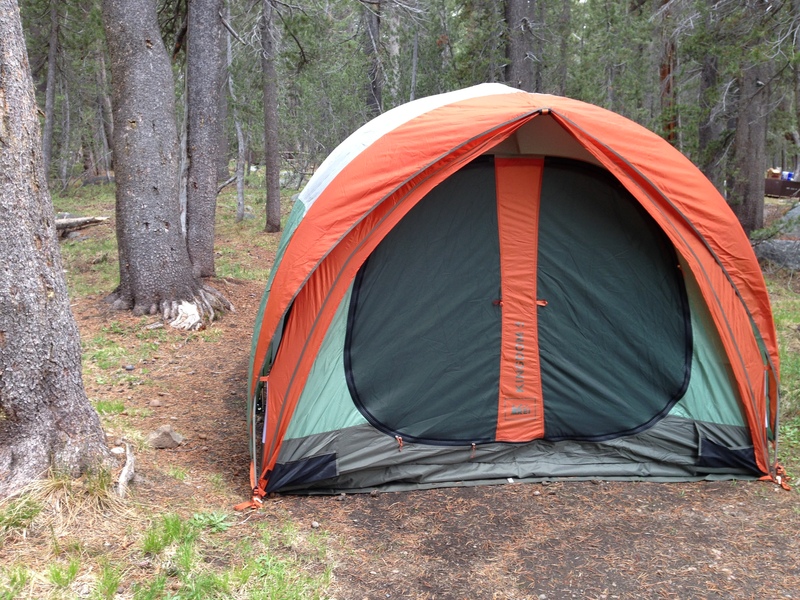 I’m camping in an REI Kingdom 4 tent that has over six feet of headroom. No claustrophobia for me. The Visitors Center day consisted mainly of visitors who had only a few hours to see “all the sights.” That won’t work for a 1200 square mile park, but most seemed happy with the options of Tuolumne Meadows, Dog Lake, Tuolumne Grove, or Tenaya Lake. On another occasion, my high school French allowed me to stumble through directions to several French guests. They were very polite and appreciated my efforts. A Junior Ranger – nine years old – proudly told me about his title. He hoped to get his parents in line – do a little hiking and demonstrate an appreciation of Yosemite – a true National Park Service acolyte. Around 2 p.m., a very exhausted backpacker, Arturo, trudged up the hill to my booth and asked me about the bus to Yosemite Valley. His 65-pound pack was much too heavy for his adventure, which had begun at Glacier Point two days earlier. He was ready to go home and his spirits deflated further when I told him the next bus for the valley would not arrive until 7pm.He had just missed the 1:15. He thought about taking the shuttle bus to the store one mile away but decided instead to sit and rest. After closing my station at 4pm, I gave him a ride to “Downtown Tuolumne,” a canvas and steel frame structure that houses a small general store, a post office, and a fast-food concession. Arturo bought a beverage to restore his electrolytes. I bought a cup of soft-serve ice cream to satisfy my sweet tooth. We sat down for 45 minutes and talked about family. He was born in Colombia, but now lives in Ventura County, California. He has a son and a daughter, both now adults. I smiled when he told me his daughter’s name is Vanessa. I told him my daughter shares the same name. Ah, the coincidences of life. Arturo reiterated that he had taken on too much, but said he has many great photographs. Whether he will backpack again, I’m not sure, but he made the great effort. Like me, he is in his 60’s. Each day we learn that age poses its limitations, but we will have made the great effort, knowing that failure to do so would leave us thinking “What if?” the remainder of our lives. I could remain home with my feet propped up, watching TV and waiting for life’s end in relative comfort. But, like Arturo, I have stepped out my front door and have seen many wonders of the world, taking day-long hikes to see nature’s beauty unavailable to those who do not step out on the trail. I have no regrets.